Can't go on one of our trips? Consider a trip with Underneath the World! “When the world becomes your classroom, feelings evolve, walls break down, and true learning begins. Global service-learning courses, while different in thematic content, all share the common goal of facilitating intentional international experiences that lead students to academic and personal conclusions on what it means to be a responsible global citizen and advocate for social justice. Through a four credit course during the summer, fall, or spring term, students experience and reflect upon critical community engagement and global citizenship, through the perspective of their course themes. A short-term international experience serves as a central “text” of the course, which provides students with experiences and a new lens through which to understand course themes and their community-engaged experiences. 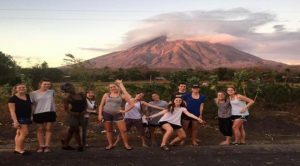 Global service-learning at Providence College is guided by values of: collaborative engagement; global citizenship; reciprocity; academic rigor; curiosity; focused and genuine inquiry; listening with empathy; and a culture of social responsibility. Our program works toward developing critical consciousness among learners, so we can question our historical and social position and to view the world through a problem-posing lens. We also deeply value the voices and perspectives of our community partners, and those most directly affected by their work in their local communities. We see our community partners–both those in our local context of Providence, as well as globally–as an extension of our learning and teaching community. How can we contribute to combatting racial inequities, economic injustice, and other systemic forms of oppression, from a place of empathy and humility? How do we perform responsibly and justly as Global Citizens socially, economically, and as agents of collaborative engagement? How do we take what we learn through these experiences, and advocate for social justice? The Community Literacy Practices course will focus on the pedagogical experience of teaching English in an international environment. Learners will come to better understand the role of teaching and learning English as a foreign language through the development of the four-skill model of foreign language learning: listening, speaking, reading, and writing competencies. Students will also have the opportunity to explore the rich culture, history, and language of Argentina through a weekend experience in Buenos Aires, before traveling to Benjamín Paz for their community engagement experience. This course and trip will be led by Dr. Nuria Alonso-Garcia (Global Studies & Urban Teaching) and Gabriella Sanchez (Community Partner). The class will work with community members in Tijuana, México through Esperanza International, a transnational non-profit organization that works to build a community both literally and figuratively along the border of the U.S and México. In Tijuana, participants will work alongside Esperanza community members to help build homes. Participants will also explore other facets of border life, through a variety of excursions which include visiting a health clinic, the border wall, a migrant house, and more. The course and trip will be led by Dr. Kara Cebulko (Global Studies & Sociology) and student trip leaders. The Global Service Learning application for Spring 2019 courses is available here. Scholarships for underrepresented students, including students from multicultural backgrounds, first generation college students and students with high financial need can apply for scholarship opportunities here. Scholarships cover 25% to 75% of trip cost. Both Global Service-Learning applications and Scholarship applications are due to Feinstein Academic Center 402 by Tuesday, October 9th, 2018 by 4:30pm. A $50.00 deposit in exact cash or check is due by the time you submit your application. Try your best to bring the payment in exact change if paying with cash. For information about courses and trips offered in previous years, see here.